The real tagline for this podcast is “a food podcast for schmucks,” that alone gives you the first hint of what is to come from chefs Allison and Matt Robicelli, their teenaged sidekick Noah Parker, and producer Evan Siple, recognized for his work on the award-winning podcast, The City that Breeds. Food will always be central in the bantering by this motley crew, although you can be assured of off-the-wall discussions (arguments). Beneath all the bickering is humor, off-color comments and occasional truths to be learned. Nothing, I mean nothing, is sacred, no holds barred with this group. 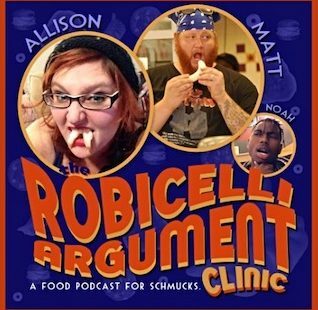 The Robicelli’s debuted The Robicelli Argument Clinic in January 2019 after their successful yet irreverent guest appearances on The City that Breeds podcasts. As one of their guests on the recent podcast, Family Table of Despair: Drink, Scream Cry, I served up a theme, the family table, which for me stirs fond and happy memories, not so for the Matt, Allison, Noah, and Evan. Those memories took everyone else as Allison called it, “A DARK PLACE.” The fun starts there and moves to basements, rye bread, and a 1940’s pin-up calendar. Brooklyn born with an Italian/Norwegian heritage, Allison comes to the podcast table with strong roots, well anchored in this New York borough. She had numerous years in the hospitality industry from working in restaurants and catering. After meeting and marrying Matt, they opened a gourmet foods and sandwich shop that begat their popular cupcakes, which begat their first cookbook, Robicelli’s A Love Story, with Cupcakes. Now, parents of two pre-teen sons, they have made Baltimore their home where they both do restaurant consulting, recipe development, writing and now, adding the podcast to their already lengthy CVs. Allison claims the title as a D-list celebrity-chef to round off her numerous talents; author, humorist, and nationally known culinary personality. You will find her in the numerous nooks and crannies of the food media from Eater, Food 52, Food Network, and more. Allison is the loudest of the couple, so she seems to get the most recognition but don’t sell Matt short, he is an integral cog in the bantering, humor, and angst generated within this segment of life with the Robicellis.